One of the best parts about being on Instagram is the nail art community. I have only been active in it a few short months now, but I can safely say I have never met a more supportive and welcoming group of people! Among my many new friends is the lovely @natasha_dauncey. I look forward to her comments and posts every day, so when I was invited to do a birthday collaboration for her I jumped right on it! 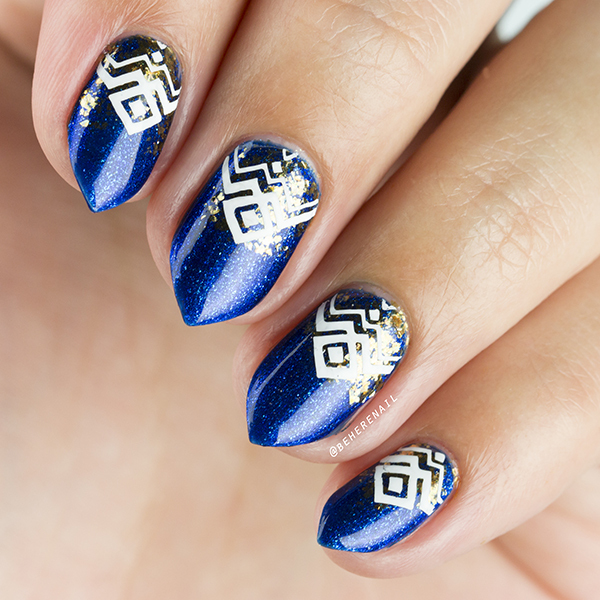 She is always slaying these fashionable geometric designs so I tried to play on that here using a couple of her favorite colors, royal blue and gold. The base color is Sinful Colors Ciao Bella, and I just have to talk about Sinfuls for sec because I love them, can't help myself, for so many reasons. The first being that I am new to nail art. I started painting my nails back in December of 2015 and got into stamping shortly after. 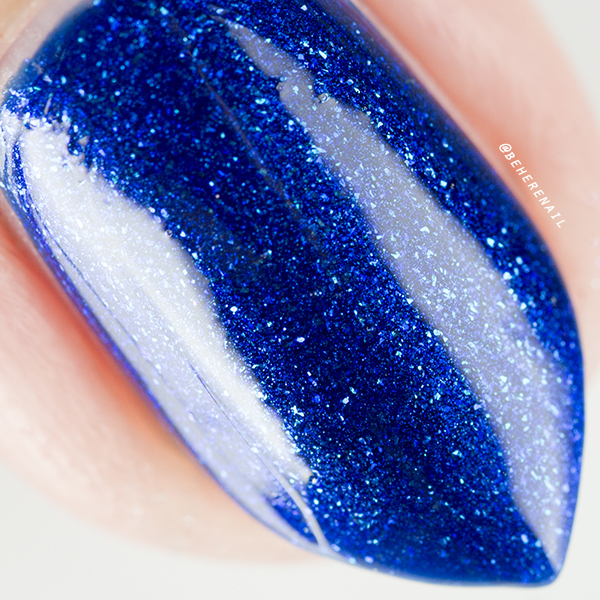 It spiraled quickly out of control and I found myself constantly without shades that I needed to get what was in my head onto my nails! At $1.99 a bottle I was able to pick up a lot of those shades to speed up the rounding out of my collection. Those semi-weekly Walgreens trips became therapy for me, and they still are! I will go on my lunch break to decompress, late at night when I can't sleep, when I have a bad day... do I even need a reason? Just to see if any new pretty colors popped up, or maybe something was restocked that I haven't gotten my colorful paws on yet. Anyhow, I really love them and I think they are fantastic if you don't have much cash to drop on nail polish but you still want to do amazing art. They make up about a third of my polish collection. Back to the mani, ahem... So those gold flakes are from my other favorite mainstream brand, Zoya. That's Maria Luisa lightly sponged on to provide some visual interest behind my stamping. 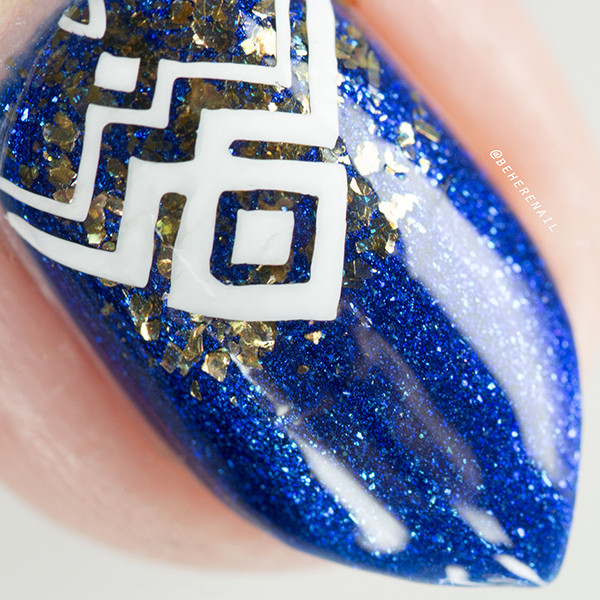 I used one of my favorite plates, MoYou London Artist 17, and stamped in Mundo de Uñas White. I find myself using those two artist plates, 9 and 17, quite a bit. The images are extremely versatile and give you super gorgeous, uncluttered designs which I have been really into lately. Am I boring you guys with those yet? Hopefully not! I will see you back here tomorrow with another skittlette and tales of my homeland. I am really enjoying your blog so far, BTW. I too used to enjoy polish shopping therapy - it was a treat (IMHO, a well deserved treat) for going to physical therapy or a doctor appointment. I don't blame you, they really are great. So happy you are enjoying the blog! I have so much planned for it but life is getting in the way of my nails! Hahaha, hopefully when I get back from vacation I'll be able to share more with you. Thanks so much for keeping me company, Kim.